Whether you have a commercial or residential property, using professional window cleaning in Vancouver is a worthwhile investment, and here is why. Cleaning windows in a thorough and detailed manner can often be a much longer and more arduous task than first expected. While professionals can make the job look extremely quick and straightforward, they also have extensive training and experience, combined with the best tools and equipment for the job. In choosing to use a professional for your window cleaning, you are freeing up your own spare time for whatever you need to do instead. Another reason to opt for professional window cleaning in Vancouver is that you are guaranteed a better end result than if you had completed it yourself. With the experience and commercial-grade equipment and tools that are used, cleaning your own windows is never able to result in the same sparkle and sheen as a professional job. For a business, this is especially important, as the appearance of your property is directly linked to how customers and clients perceive your company. One of the most important reasons to use professional window cleaning in Vancouver is for health and safety reasons, which should certainly not be overlooked. While windows that are within reach, without using a ladder or stool, may be more straightforward to clean, there are routinely areas that will require assistance. This is where the many years of experience and professional equipment come into its own, as it allows the window cleaner to safely and easily reach the hard to clean spots. Professional window cleaning in Vancouver is far more affordable than many people would imagine, making it accessible for the vast majority of people. For a profitable business, there is no excuse not to engage in professional window cleaning in Vancouver, with residential property owners also highly advised to leave this task to the experts. 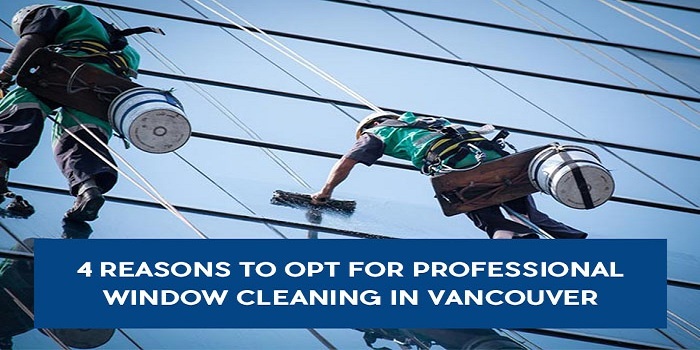 In being affordable, time-saving, and with assurance of a better finish, along with the health and safety benefits, it is easy to see why using a professional for window cleaning service in Vancouver makes so much sense. Why not get in contact with a specialist company today and arrange for your windows to be restored to their natural shine and glow?